Rob Hanna, skipper of the local favourite Shogun V looked like the smiling assassin when he came ashore this afternoon at the Festival of Sails. Today’s two wins and a third has kept Hanna in second place on the standings after seven races, but importantly narrowed the gap to two points shy of Marcus Blackmore’s overall lead with Hooligan in Audi IRC Australian Championship division 1. Some clever manoeuvres by tactician Steve McConaghy has put Shogun V within striking distance of the IRC Championship win that eluded Hanna by one point the last time he and Blackmore squared off for the prestigious national title at Audi Hamilton Island Race Week in August 2012. Hooligan, Jason Van Der Slot’s Calm 2 and Shogun are not only lined up like ducks in a row on the IRC pointscore, many times today they were side-by-side on the course and barely separated at mark roundings. Demonstrating how close the racing is, Calm 2 was holding Hooligan out before the final tack to the first top mark rounding in race five. 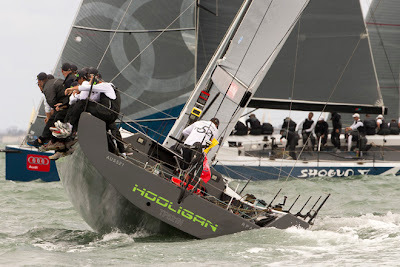 The pair tacked simultaneously, Hooligan called for buoy room but Calm 2’s crew didn’t oblige so Hooligan cheekily created its own fortune, swinging on its axis inside Calm 2 and sneaking into second place behind Peter Harburg’s Black Jack, a gutsy move that had the photographers salivating. A new player is featuring at the top of the Audi IRC Championship division 2 pile. Anthony Dunn’s RP42 Equinox II has rolled the Beneteau First 45 Senna out of the top three, Dunn now sitting behind Ikon, following Bruce McCraken’s race seven win, and Reverie. In Audi IRC division 3, three more wins for Grant Botica’s Adams 10, Executive Decision has Botica a step closer to his hat-trick of divisional wins at the Festival of Sails and being named one of three Audi IRC National Champions for 2013. 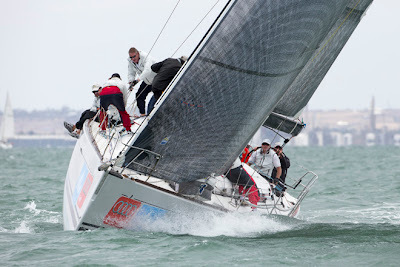 Equally consistent but with more seconds than firsts is Roger Hickman’s Sydney based Farr 43 Wild Rose, currently five points behind Botica and his slick crew. IRC division 2 starts today were noisy and messy for some, Sally Rattle’s Archie nudging Ikon at the start of race five while Hickman was locked out of the race six start, but still managed a second on corrected time. Hickman, an old hand at this racing business, is working closely with his 16 year-old tactician, Alice Endersbee, an International Cadet sailor from Melbourne who also has her younger sister aboard the 27 year-old boat. “We are having an absolute ball,” said Hickman. On his young tactician he added, “The good thing about sailing with young people is they have the confidence to make the calls without worrying about egos on the boat”. Third behind Wild Rose is Sally Rattle’s Archambault 35, skippered by Scott Brain and sailing for the Derwent Sailing Squadron. Archie has an outstanding record of inshore and offshore racing results, including winning several major coastal races, and Rattle has the honour of winning the Australian women’s keelboat regatta on Port Phillip last year. 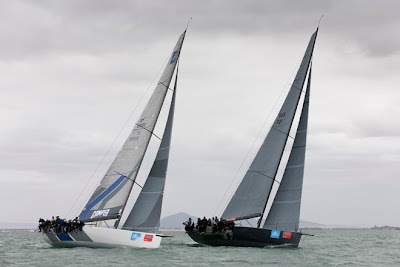 Conditions on Corio Bay’s outer harbour, where Audi divisions 1, 2 and 3 were racing, were moderate, mostly cloudy skies and a choppy dark green ocean kicked up by a cold SE then southerly 16 knot breeze. There was plenty of bump and grinding on in the first two races, by the final race seven the southerly had backed off to 11-14 knots. Tomorrow is the last chance to make an impact on the standings and be in the mix for Audi’s fantastic prize pool for the top three placegetters. Racing is due to start at 11.30am and the forecast is for S-SW’ly winds at 15 - 22 knots average easing to 10-15 late morning before increasing to 18-20 knot during the afternoon. A dockside presentation for the three Audi IRC winners will be held at the conclusion of racing with the official presentation to be held at the host club, Royal Geelong Yacht Club at 10am Monday morning, January 28th, when trophy winners from all divisions will receive their silverware. One windward/leeward and one special course will wrap up the nine-race Audi IRC Australian Championship series and decide the three champions for 2013, but for now crews are readying for tonight’s shoreside Australia Day celebrations where they will join with thousands of festival-goers.